A week ago, this post would have been laughed right off the internet. Well...it still could be, but we're feeling ambitious. I might be doing the equivalent of the SI-jinx here, but right now the #1 and #2 contenders for the He16man Trophy are Meeeechigan's Denard Robinson and tOSU's Terrelle Pryor. These two QBs play very similar football, but different enough to classify them in two unique camps: Denard is in the Pat White camp, Pryor in the Vince Young camp. High praise for both young men. But one thing both players share is their importance to their offenses. 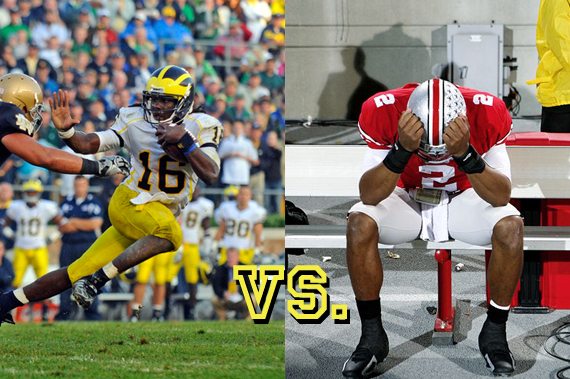 Both Michigan's and tOSU's offense will go only as far as each QB can take it. While Tate Forcier provides some insurance for Michigan if Denard is out, that doesn't make Michigan fans sleep any better at night now does it? What we're going to do each week throughout the season, is give you a side-by-side stats comparison. While there's a lot more than just stats that go into a He16man vote, stats can at least get you on a plane to New York in December. Is this all a bit premature? Yes. But when the top 2 Heisman candidates, so far, are from Michigan and tOSU...you better believe we're going to discuss it. We're a Michigan blog, this is what we do. ***Update: Reader "jusgre" pointed out that I didn't include the passer rating stat. This was my mistake, and it has been added. And no, tOSU fans, I didn't forget to include it because it makes Pryor look better. According to http://www.primecomputing.com/, that gives Pryor a quarterback passer rating of 158.69 versus Robinson's 138.26. Might that be a number worth including as well? Thanks for pointing that out. I've added it to the stats list. Notre Dame's defense - ranked #86 in 2009. 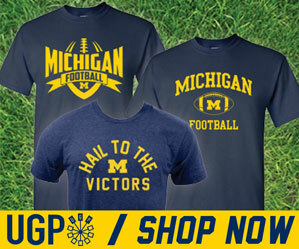 Michigan has played the equivalent of Bowling Green and Duke so far this season. I think you should also add a yards per attempt for rushing and passing (or yards per completion). Perhaps even a yards per touch is a good metric. I'm a Buckeye and even I must admit that Denard Rob is a phenom. It remains incumbent upon the Michigan defense, however, to keep up the pressure on the opposing offense. I have trouble seeing a Heisman winner on any team with more than 4 losses, and even 3 losses are pushing it. Also, it remains to be seen whether Denard can stay healthy for a full season. If Michigan's defense doesn't step it up in Big 10 play and if Denard gets dinged up, I don't see him winning the Heisman. I don't see Pryor winning it, either. I would, except Denard didn't play against UConn's and ND's defenses in 2009...he played them in 2010. Time will tell how good these defenses will be this year. To be fair, Marshall is ranked #114 so far this year, and Notre Dame is ranked #102.